The Wilderness Systems brand is strong and their offering to the fishing industry is solid. Take a look at their lineup below. We've included some top picks for videos about their fishing kayaks as well. 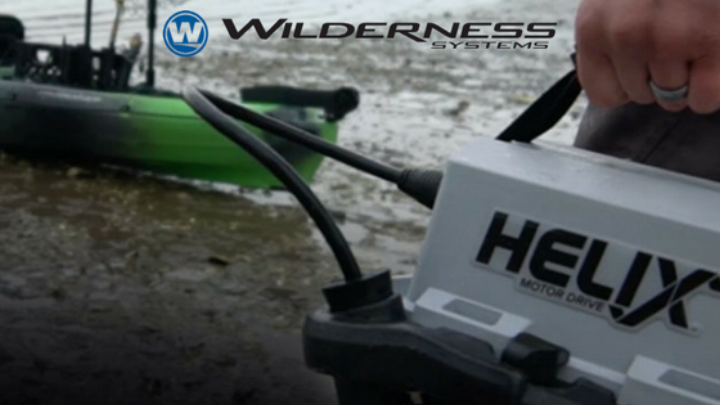 Wilderness Systems debuted the Helix MD Motor Drive. Partnering with the proven technology of Torqeedo, the new Helix MD Motor Drive is a step ahead in the world of kayak propulsion technology. With top speeds reaching up to 6 mph at a range of around 20 miles and featuring a solar-rechargeable lithium battery that lasts up to 8 hours and can charge while underway, the Helix MD Motor Drive simplifies the experience of kayaking by taking you farther, faster. Available with pedal drive and electric motor options. Click here to see their full line of fishing kayaks from Wilderness Systems. Call 603-753-9804 or e-mail us with any questions.